Our main lodge is located at 9491 Highway 97 East, Gonzales, Gonzales County, Texas 78629, approximately 75 miles SE of Austin. 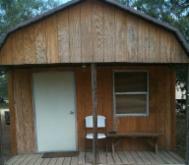 The main lodge consists of 265 game-fenced acres, and has exotic animals from all over the world, as well as wild hogs. Most hog hunts take place at this location. When available and when booked in advance, additional ranches in the area can be hunted for a trespass fee of $49/hunter/ranch. Additional kill fees of $100.00/hog apply, with no additional trophy fees for larger hogs. The javelina and whitetail deer hunts we offer occur in South Texas near Laredo, which features different ranches ranging in size from 500 to 1500 acres and are both game fenced and free-range hunts. Meals are provided by the ranch staff. The exact menu can vary, but usually includes five (5) meals during your hunt. The meals consist of two (2) dinners of different meats, sides, and non-alcoholic drinks. For lunch, we serve cold cut sandwiches, chips and a drink. We offer typically two (2) breakfasts, consisting of traditional eggs, gravy, biscuits, and meat. Sometimes, a different hot breakfast is served, such as Mexican tacos or breakfast burritos. On the last morning of the hunt we usually serve a continental breakfast. 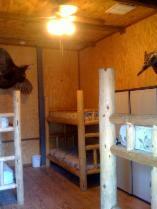 All hunters will be provided a bunk in the bunkhouse at the lodge on the ranch. If you prefer more privacy, you may upgrade to a private room or cabin.